From time to time an earthquake of perceptible magnitude causing damage of different kinds and severity strikes our country, calling to mind that Spain, though not one of the most earthquake prone, still has a history of experiencing seismic shocks, some of considerable intensity. The quake felt in the region bordering the Alboran Sea on January 2016 serves as the latest reminder. In point of fact, the main article in this volume four of our bulletin, written by José Manuel Martínez Solares of the National Geographic Institute [Instituto Geográfico Nacional], a leading expert on the subject, reviews the major tremors that have hit the Iberian Peninsula, including this latest episode in the Alboran Sea. In addition, the still recent Paris Climate Conference (COP-21) has mapped out a promising way forward in fighting global warming and preparing for the challenges of adapting to the various climate change scenarios. With this in mind, the Editorial Board has seen fit to address this topic in the “Contributions” section. In this connection it felt it would be of interest to offer a look at the views of the Spanish Bureau on Climate Change [Oficina Española del Cambio Climático (Spanish Climate Change Office)] on the Conference and its achievements, since the hard work of the OECC was closely interwoven throughout the entire fabric of the negotiations. The article by Vera Estefanía González and Raquel Garza Garrido of the OECC sets out a series of considerations in this regard, and from the outset, with its title, underscores that the Conference marks a great success for multilateralism. Along these same lines, another “Contribution” by David Moncoulon, an expert in the modelling of natural hazards who works for the French Caisse Centrale de Réassurance (CCR), is an article setting out an analysis of the projected effects of climate change on trends in insured losses caused by natural disasters in France in 2050. 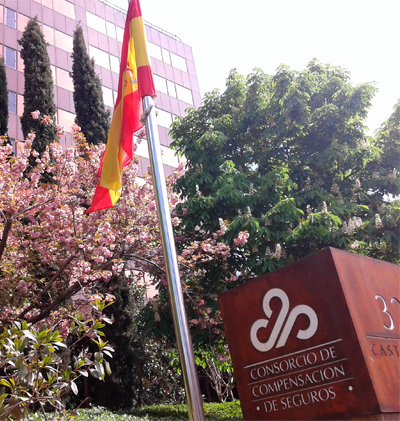 In his turn, Francisco Espejo, from the Consorcio de Compensación de Seguros (CCS) brings his expertise in climate issues to bear in an article dealing with the most salient aspects of climate change from an insurance perspective, focusing on the case of Spain of direct concern to the CCS. Lastly, the content of the bulletin also includes reviews of several recently published texts and is topped off by a commentary on case-law by José Antonio Badillo (of the CCS) and, in the “Topics of Interest” section, a note on the recent setting in motion of the Register of Compulsory Insurance [Registro de Seguros Obligatorios] under the management of the CCS. From time to time an earthquake of perceptible magnitude causing damage of different kinds and severity strikes our country, calling to mind that Spain, though not one of the most earthquake prone, still has a history of experiencing seismic shocks, some of considerable intensity. The main article in this volume four of our bulletin reviews the major tremors that have hit the Iberian Peninsula.